When Fall arrives, I just can't beat the urge to bake. I swear, if I could, I would bake something every day. and decided it was about time I give it a try. In a large bowl, mix the flour, baking powder, baking soda and salt. In another bowl, beat the sugar, sour cream, eggs and vanilla until well blended. Stir into the flour mixture just until moistened. Fold in the apples and 1 cup of pecans. Transfer to a greased 9x5 inch loaf pan. Bake at 350° for 50-55 minutes or until a toothpick comes out clean. Cool in pan for 10 minutes. Remove to a wire rack to cool. In a saucepan, bring butter and brown sugar to a boil. Cook and stir for 1 minute. Spoon over bread. Sprinkle with remaining ¼ cup of pecans. Let stand until set. **To toast pecans, bake in a shallow pan in a 350° oven for 5-10 minutes, or cook in a skillet over low heat until lightly browned, stirring occasionally. 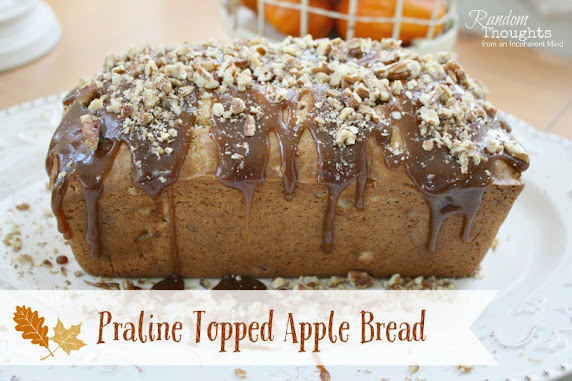 This Apple bread sounds divinely delicious!!! "Mr. Ed" loves Pecans. . .and I can have NO Cinnamon!!! Autumnal weather makes me want to bake breads, cookies, pies, pot roast. . .
well, dear friend, you get the idea!!! Wishing you a wonderful Autumnal weekend ahead!!! I will have to give this a try. It looks so good and not alot of ingredients. Oh yum Gina...that looks good enough to eat!!! lol Thanks for sharing! Thanks for sharing the recipe, Gina. You know, October is most favorite month! It's a season filled to the brim with glorious things; leaves, candles flickering, pumpkins, and of course.. baking! And, I sure hope you had a great birthday too! My doctor says I have to try to go sugar free, so this post made me actually weep - oh my gosh it looks sooooooooooo good, Gina! YUMMMMMMM! Oh Gina, I would love to make that bread, and wish I had the apples that we picked in an orchard in Ohio over the weekend. Sadly, we had to leave them behind for our relatives to enjoy. OMW Gina, this sounds wonderful! Thank you for sharing this recipe. What's not to love with a Praline topping?! Have a wonderful week! Oh, heaven, this looks awesome. I have to make it, hubby is a dessert fiend and will love it. Love your mantel in your last post. I've been wanting lights...these are subtle. Do you remember where you found them? Oh my goodness....this looks so good Gina. 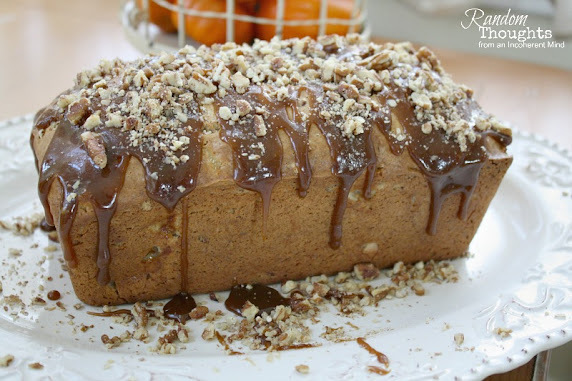 Hee, hee, hee, my mouth is watering :-) Thanks for sharing the recipe. Yummy! I was just thinking of getting a cuppa somethin hot and your delicious looking loaf would be perfect!! I had fun taking a photo shoot of some Apple Crisp today! Will post later. Thanks for the recipe my friend.